Microsoft Access is the only database management tool that enables its users to store and maintain almost all kinds of information – ranging from inventory, business processes, to contacts. This tool is of great help for small organizations and teams for managing their day to day data. In MS Access 2013, Microsoft has included some really advance features for making it more useful with web. 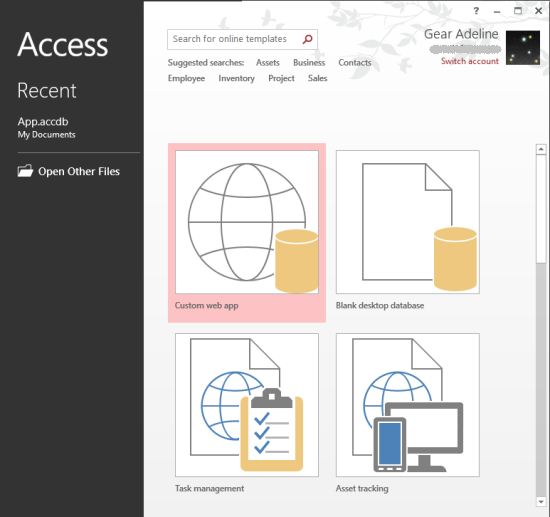 Let’s take a look at what’s new in Access 2013. Unlike old boring user interface of your MS Access database the new release i.e. MS Access 2013 provides you professional and more polished user interface. Most of the things in Access are now automatic, like Access will generate views of your data automatically without single effort from your side. Improved buttons enable you to navigate between views and tables flawlessly. Having Office 365 plan that has SharePoint enables you to launch Access 2013 with no requirement of some extra setup. Your entire data on the cloud is backed up, secured, and managed by Microsoft. You can access this data on any tablet or computer even when it is not having Access installed. With the help of fast user interface of the software you can search for people, place, thing, tasks, or events included in your database just in one click. Moreover, combining different templates of tables in a single table and altering an existing table is fast and simpler. This new release of MS Access also lets you import your data from an Access desktop database, ODBC data sources, MS Excel files, SharePoint lists, and text files. Access 2013 lets you work with your SharePoint 2013 effectively because of its SharePoint like user interface. You can manage, deploy, and share your data easily through SharePoint app store. Moreover, you need not to provide any extra password for the security of your data as the integrity of data is being controlled via the same infrastructure. Apart from all the above mentioned advantage of MS Access 2013, one of the biggest achievements is you can now use Access 2013 SQL-server as backend. When you publish MS Access to SharePoint, through cloud by using Microsoft Office 365 or within the premises, you will find that SQL Server database is created automatically. The previous versions of Access need approximately 5 steps in the wizard to set up the look up, but in the new version i.e. Access 2013, it is now a single step process. Moreover, the description is now so much simple that the people who never have heard about ‘Foreign Key Constraint’ or ‘Normal Form’ can also create the look ups easily and hence prevent erroneous data. The new, improved, and efficient user interface and enhanced features of Microsoft Access 2013 make it a much better and easily accessible database management system.